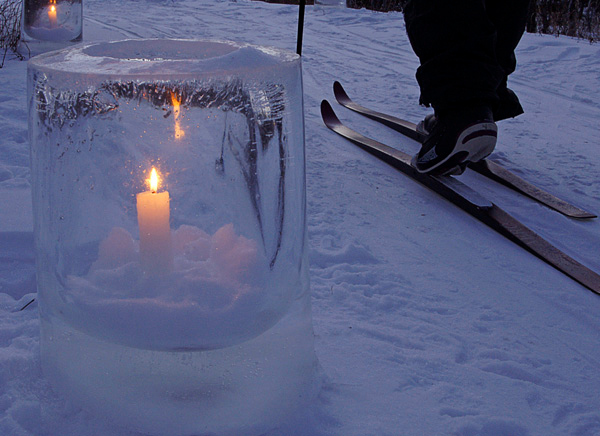 We held our annual candlelight ski at Gooseberry this weekend. It was near perfect weather. 27 degrees with little wind. 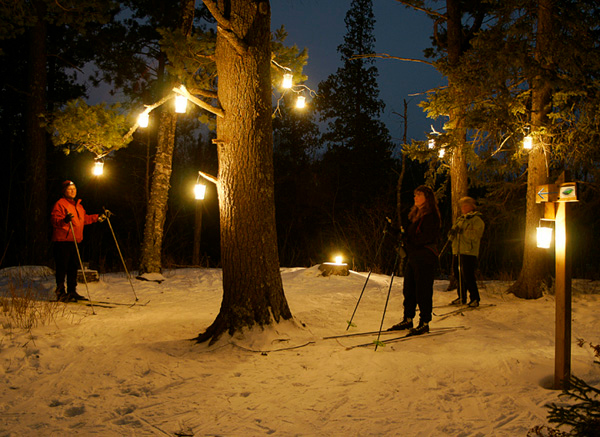 About 400-500 visitors came to ski, snowshoe or hike. 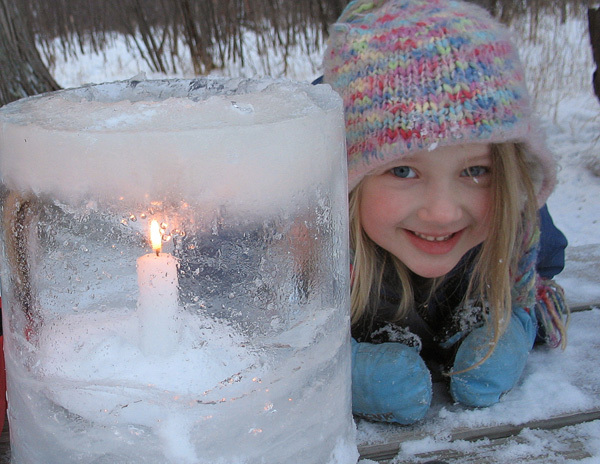 Volunteers lighted 6 kilometers of trail with 60 ice luminaries and 500 plastic cup candles. It takes about 30 volunteers to place, light and pick up the candles and cups after the event. One of the volunteers, Paul Wannarka, placed several of the candles in the branches of a white pine. It was so beautiful that it brought tears to some visitors’ eyes. Many people said it was the highlight of the evening. The candlelight ski wasn’t the only excitement this week. We have a timber wolf pack roaming the area and this week they were hunting around the visitor center and campground. An alert park visitor took a photo of a wolf right outside the window of the visitor center. Another visitor saw three wolves by the park entrance and one of the Gooseberry staff was lucky enough to see the whole pack. The pack currently has five members. 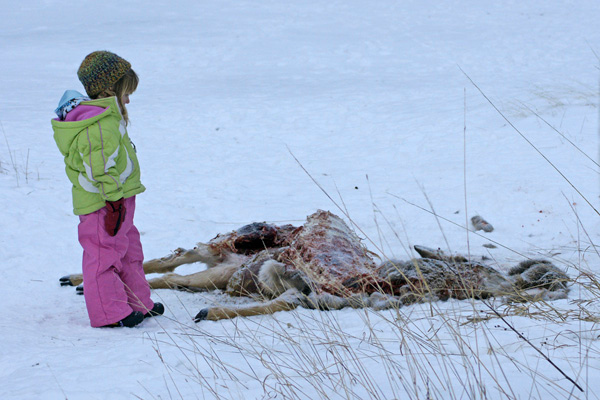 This week we have found remains of four deer that the wolves have taken down. The one that caused the most excitement was a doe caught along the shore of Lake Superior. I came up on the wolves and scared them off before they finished their meal so several park visitors were able to see not only the tracks but the remains of the deer. 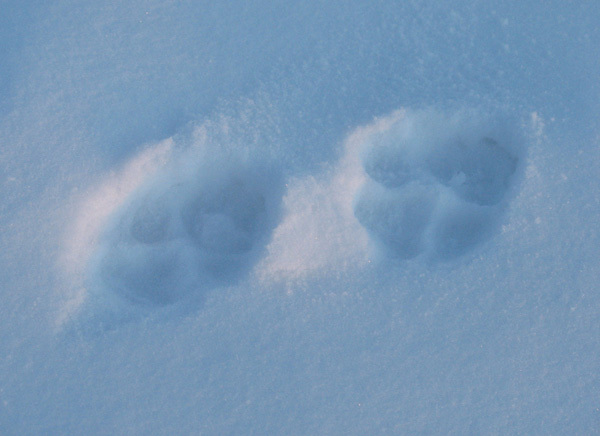 If anyone is interested in reading more about wolves, there is a winter study currently taking place on Isle Royale, go to http://isleroyalewolf.org/wsjournal/wtrstdy/index/index.html to read the daily diary entries.